Anamorph: class Hyphomycetes, order Hyphomycetales, family Dematiaceae, genus Rhynchosporium. Teleomorph is not known. Hemibiotrophic parasite attacking cultivated barley, rye and some wild Hordeum species. Forma specialis on barley and rye. The Scald is characterized by the distinctive lesions forming on coleoptiles, leaves, leaf sheaths, glumes, floral bracts, and awns. Infection appears first as dark or pale gray lesions, which later assume a watery appearance. Later the centers of lesions dry out and bleach, turning light gray, tan, or white, and their edges turn dark brown and can be surrounded with a chlorotic region. The lesions are oval to oblong, not limited by leaf veins. Most lesions occur on leaf blade and sheath. At floral infections the lesions with dark brown margins and light tan centers arise on the inner surface of floral squama near the awn base. Mycelium is hyaline to light gray, developing sparsely as a compact stroma, several cells in thickness, under cuticle of a host plant. Sessile conidia (2-4 x 12-20 mkm)form on cells of the fertile stroma. They are hyaline, one-septate, cylindrical to ovate, having a short apical beak. Microconidia of R. secalis have been reported, but their function is unknown. Sexual stage is not known. Infected host residues and seeds are the sources of primary inoculum. There is no evidence that R. secales survives saprophytically in soil. Mycelial hyphae invade the coleoptile from the pericarp and hull of infected seed as it emerges from the embryo. The fungus sporulates on wet lesions only after leaf tissue becoming necrotic. The wetting time required for maximum spore production decreases as the temperature rises. The disease is widely distributed throughout the world. In NIS countries it meets in the European part of Russia (North-Western, Central, Ural and Volga Regions, the North Caucuses, and the Far East), also in Belarus, Ukraine, Baltic States, Kyrgyzstan. Spore production is optimal at 10oC and after 72 hr of wetting. Longer wetting periods than optimal ones lead to death of spores. During alternating wet and dry periods the temperature response curves are similar to those obtained under continuously wet conditions, but few spores are produced. None conidium forms at 30oC. Moisture is also essential for the R. secalis conidia dispersal. Most spores captured in spore traps are caught during or right after rain or overhead irrigation. Splashing water droplets are necessary for the conidia release from sporulating lesions. Mature lesion can produce to one million spores, which are readily released in water, but the number of airborne spores is relatively small. The disease development depends on local inoculum, because there is no significant long-distance spore dispersal. The optimal temperature for spore production is between 15 and 20oC, and this range is also favorable for infection. The fungus sporulates poorly at temperatures below 5oC or above 30oC. The temperatures from 5 to 30o C are fairly typical of barley-growing areas. The R. secalis is most important in the Northern Caucasus, North-Western and Central regions of Non-Chernozem Zone, in Baltic region (Latvia, Lithuania), Belarus, Ukraine, Kyrgyzstan. In these regions the disease severity can reach 50-60% under favorable conditions. The disease severity 28-35% can cause the yield losses to 50-60%. In North-Western Ukraine average yield losses are estimated as 20%. Damage is significant, when the disease severity is 20% or higher. Domashova A.A., Malyutina R.M. 1966. Studies of scald (Rhynchosporium secalis (Oud.) Davis) in Chuiskaya Dolina in Kyrgyz SSR. In: Fungal diseases of agricultural crops in Kyrgyzstan. Frunze: ILIM, p. 106-110 (in Russian). Drapatyi N.A. 1984. Long-term forecast of scald in the North-West Region of Ukraine. Agricultural science news (Kiev: Urozhai) 1: 30 (in Ukrainian). Guzeva L.I., Trushko N.A. 1990. Scald of cereals in Latvia. In: Ecological problems of plant protection. Abstracts of reports of Conference of Young Scientists. Leningrad: VIZR, p. 76 (in Russian). Ishkova T.I. 1987. Harmfulness of Rhynchosporium diseases of barley and rye and influence of weather factors on dynamics of disease. In: Ecological aspects of harmfulness of cereal diseases. Leningrad: VIZR, p. 52-58 (in Russian). Ishkova, T.I., Berestetskaya, L.I., Gasich, E.L., Levitin, M.M., & Vlasov, D.Yu. 2000. Diagnostic of the main diseases of cereals. Saint Petersburg, 76 p. (in Russian). Kostylev A.D. 1935. Barley leaf blotch Rhynchosporium graminicola in Azovo-Chernomorskii Breeding Center in 1933. Rostov na Donu: Azovo-Chernomorskoe Regional Publishing House, 19 p. (in Russian). Kotova V.V., Butrymovich I. 1995. Scald of cereals - features of development, measures of control. In: Cereal protection from diseases in modern agriculture. Saint Petersburg: VIZR, p. 52-58 (in Russian). Luk.yanova L.G., Tukalkina T.E., Bakulina G.F., Kulakova, M.A., Bandulevich, N.I., Gordenko, V.I., Mukhina, M.Yu. 2004. Forecast of the pests and diseases occurrence and distribution in crops in 2001 year and its control. Nizhnii Novgorod: Nizhegorodskaya regional station for plant protection, 118 p. (in Russian). Mathre D.E., ed. 1997. Compendium of barley diseases. APS PRESS. 90 p.
Novozhilov K.V., Zakharenko V.A., eds. 2000. Levels and tendencies of variability of species composition and intrapopulation structure, areas of complexes of harmful and useful organisms and forecast of dangerous phytosanitary situations on zones of the country. St. Petersburg: VIZR. 100 p. (in Russian). Peresypkin V.F., Drapatyi N.A. 1978. 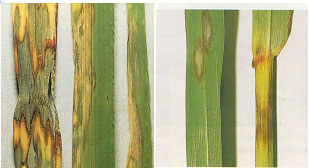 Occurrence and harmfulness of scald on barley. Mikologiya i Phytopatologiya 12(4): 314-320 (in Russian).